123. Champion, Mickie – What Good Am I? Hold tight for a trip back in time that will blow your mind, with some fantastic tunes, dance moves, and some assorted videos . 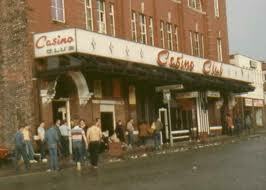 Wigan Casino first opened it's doors on September 23rd, 1973 to the sounds of "Put Your Loving Arms Around Me" by The Sherrys, and 652 people walked in. It must have seemed inconceivable at the time that Wigan Casino Soul Club would eventually have over 100,000 members, and would be voted "Best Discotheque In The World". 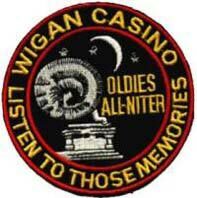 The man behind the idea for Wigan Casino was Russ Winstanley, a local man who had been playing Northern Soul to the locals via "Russ' Everysound Disco' at venues such as the Wigan Beer Keller and Wigan Rugby Club. Fuelled by the rumours that the Torch was in trouble with the local authorities and was likely to be closed down, Russ approached the owner of the Casino Club, Gerry Marshall, with the idea of running an allnighter at the venue. The idea was originally rejected, but after repeated attempts by Mike Walker, the manager of the venue, Gerry Marshall relented and gave the go-ahead for a trial night. After first night profits of £400 materialised, it became apparent that the allnighter could be a success, and regular Saturday night allnighters began. The Casino Club, or the "Emp", (an abbreviation for The Empress Hall, the Casino's original name) was built around the time of the First World War, and was perfect for an allnighter. A massive maple sprung dancefloor dominated the building, and a large stage was situated at one end. A balcony circled the dancefloor on three sides, giving a perfect view of the dancers beneath, albeit dimly lit by ultraviolet tubes hung from the ceiling on chains. An added attraction was that this layout was repeated in a smaller room off to one side, named Mr. M's. With both rooms open, the venue had a capacity of 2000 people. However, the Casino could hadly be described as plush; the furniture was basic, the carpet was threadbare, and the toilets... well, I think you can imagine. The one thing the Casino had was atmosphere. It was electric. From the moment you joined the queue, the excitement would build. After being crushed and pushed through the doors, had your hand stamped by Hilda Woods, you swung open the double doors to the main room and... there it was. 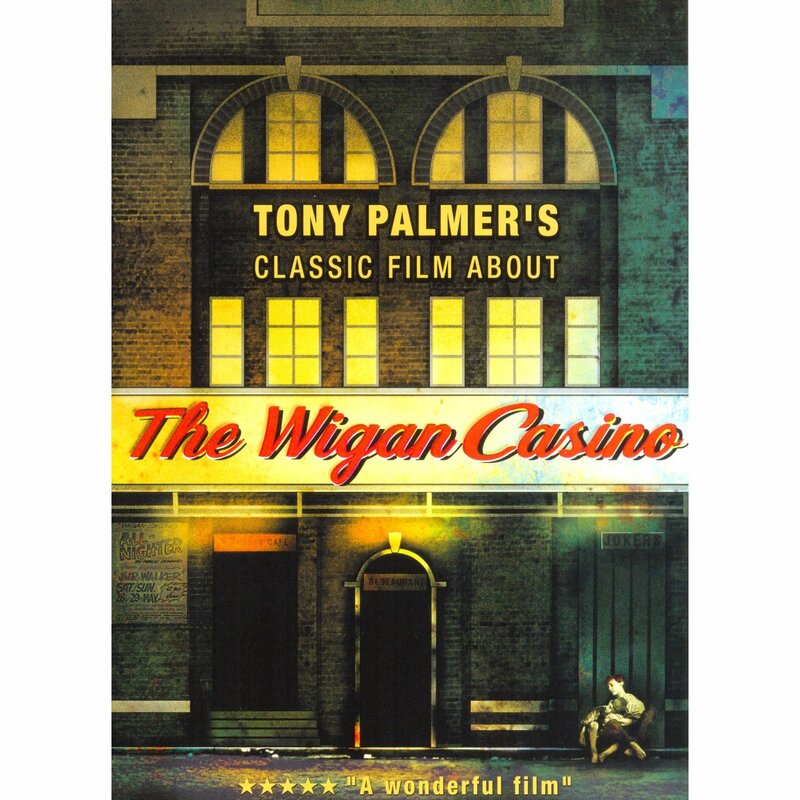 The heat, the music, the smell, the condensation dripping from the roof... nothing could, and never will compare to the atmosphere of Wigan Casino. The original DJ lineup consisted of Russ Winstanley and Ian Fishwick. Like many seventies Northern Soul DJs, Russ had a contact in the US, his uncle. With a steady supply of imports, and records supplied by contacts within Selectadisc, Russ soon had a formidable collection. DJing all night became a bit of a strain, so help was enlisted in the shape of Kev Roberts, Martyn Ellis, and eventually to become Russ' mainstay DJ, Richard Searling. Guest appearances by Ian Levine and Colin Curtis were not unheard of in the early days, as well as John Vincent, Frank, Dave Evison, Keith Minshull, Soul Sam, Pat Brady, and of course, Brian Rae. The allnighters started as a Saturday night event, originally running from 2am (to allow the early evening "normal" session to clear out) until 8am, but later on started at 12.30am, and sometimes ran until 10am. The Oldies allnighters started in 1976, which ran on the first Friday of every month. The occasional alldayer was also held, normally on a Bank Holiday weekend. There was also a mid-week soul night on a Wednesday. One subject that cannot be ignored is that of the music policy at the Casino. I'm sure that many of you will be aware of the infamous arguments about which venue played better music, Blackpool Mecca or the Casino. Neither was better. They played different styles of music, and that is all. The Mecca has been credited with playing smoother, more seventies-feel sounds whereas the Casino tended to prefer 100mph stompers. It must be acknowledged that sometimes the Casino got it wrong. "My Hearts Symphony" by Gary Lewis and the Playboys, "Nine Times Out Of Ten" by Murial Day and "Theme From Joe 90" by Ron Grainer were asbysmal, but at the time you must realise they were extremely popular. You had to be there, as the saying goes. To sum up "The Wigan Sound", listen to "Afternoon Of The Rhino" by Mike Post, "Cochise" by Paul Humphrey, "I'm Where It's At" by The Jades or "Panic" by Reperata and the Delrons and that will give you an idea. That's not to say that all Casino dancers were paced at 100mph. Try "You've Got Your Mind On Other Things" by Beverly Ann, "I Never Knew" by Eddie Foster or "The End Of Our Love" by Nancy Wilson if you fancy something a bit slower. Another subject close to the heart of Northern Soul fans is that of commercialisation. The Northern Soul scene was proud to be an underground "secret society" that prided itself on the special relationships formed between like-minded people and their love of their ultra-rare soul music. In about 1974, Mike Walker asked the Casino crowd if it would be alright for the BBC to bring cameras in to film for the TV magazine programme "Nationwide". The answer was a resounding "NO". One year later, the Casino had changed all that. Northern Soul had become big business. Record companies were watching the Northern Soul phenomenon very closely, as it gave them opportunity to release back-catalogue records and thus gaining immediate profit... no recording or promotion costs, just release an oldie! Pye were certainly on the ball, as they employed a soulie themselves, Dave McAleer. I'm not suggesting that records were being dug out of the archives and being fed to the Wigan jocks, but it did seem a bit of a coincidence at the time that a large number of Northern monsters were almost immediately available on Pye Disco Demand! With releases such as "Goodbye, Nothing To Say" by Nosmo King and the Javells, "What Shall I Do" by Frankie and the Classicals and of course "If You Ask Me" by Jerry Williams, Pye were onto a winner. Eager not to miss out on the obvious profits, the Casino made it's first attempt at getting into the record business... with Wigan's Ovation. A local band previously known as Sparkle, they released versions of "Ski-ing In The Snow" (originally recorded by The Invitations), "Per-son-ally" (Bobby Parris) and "Superlove" (David And The Giants), achieving considerable chart success. Other record companies joined in the goldrush, seeing ABC re-release titles such as "Soul Self Satisfaction" by Earl Jackson and "Like Adam And Eve" by The Relections. London issued "Night Owl" by Bobby Parris (with Yvonne Baker "You Didn't Say A Word" on the B-side) and "Girl Don't Make Me Wait" by Bunny Sigler. Capitol issued "The End Of Our Love" by Nancy Wilson, "So Is The Sun" by The World Column and an instrumental anthem "Thumb A Ride" by Earl Wright. The Grapevine label was formed, issuing a considerable number of "Popcorn" Wylie produced tracks, and their biggest hit "What" by Judy Street. 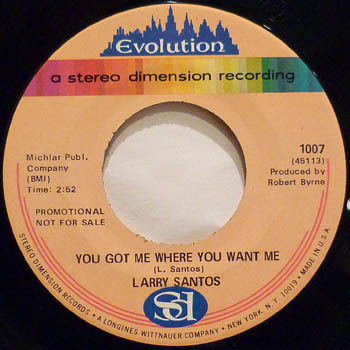 Destiny records started well with "Gone With The Wind (Is My Love)" by Rita And The Tiaras and "You Won't Say Nothing" by Tamala Lewis, but soon appeared to run into licencing problems as it began to issue re-recorded versions of Northern Soul tracks. 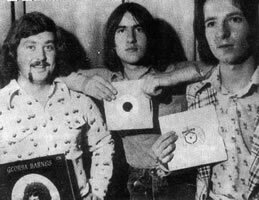 And let's not forget Inferno Records, started by Neil Rushton, who released some stunning tracks including "They're Talking About Me" by Johnny Bragg, "If That's What You Wanted" by Frank Beverly and "Queen Of Fools" by Barbara Mills. Even the popular soul magazine "Blues & Soul" had a go, starting their highly successful Contempo label, and it's Northern Soul offshoot Contempo-Raries. Another subject that sometimes raises the hackles is that of "tailor made" records, the most famous of these being "Footsee" by Wigan's Chosen Few. Originally published on Roulette as a B-side, "Footsee" by The Chosen Few (a reggae band, I'm told) was a boring relentless instrumental. Our friend Simon Soussan (or Russ Winstanley, dependent upon which story you believe) played around with it a bit, added some car horns and crowd noises and voila! the perfect Northern dance record. It was so well received that after a bit of remixing, it was released on Pye Disco Demand as "Footsee" by Wigan's Chosen Few. It even appeared on Top Of The Pops, after reaching No. 9 in the Top Forty. While we're on subject of "tailor-mades", let's not forget the Black Magic label. Part of Selectadisc, it started well with "Out On The Floor" by Dobie Gray, but then, after serious plugging at the Casino, began to issue remixed instrumental versions of classics such as "Going To A Go-Go", "Blowing My Mind To Pieces" and "Papa Ooh Mow Mow". Although going down well at the time, these records are now looked upon as a phase best forgotten in the Casino's history. It finally all came together for the Casino when a deal to release "Three Before Eight" was struck with RK Records. The "Three Before Eight" in question were the last three records to be played when the allnighter ended at eight in the morning. The three tracks were "Time Will Pass You By" by Tobi Legend, "I'm On My Way" by Dean Parrish and "Long After Tonight Is All Over" by Jimmy Radcliffe. 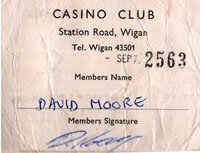 After considerable sales, it was decided to form a speciality label to release more northern singles... Casino Classics. After some wrangling, Russ managed to obtain the rights to some previously inaccesible tracks and released "Little Darling" by the Flirtations, "Lost Summer Love" by Lorraine Silver, "I Go To Pieces" by Gerri Granger, and then remixes such as "The Wigan Joker" by the Allnight Band. Two Casino Classics compilation albums were also released. A quirk of the Casino was the proliferation of badges that were produced. Every anniversary, a new badge was produced. Every occasion warranted a badge. Granted, it was the thing to sport a badge on your shirt, on your bag, even on your bri-nylon vest (I had a red one coverd with badges) but it would be impossible to wear all of the available badges in one go.